About a couple of years ago something unprecedented happened in the cricketing world. Some of the game's biggest stars took to the field to promote cricket in the United States of America. Riding on the popularity wave of T20 cricket, Sachin Tendulkar and Shane Warne came up with a novel idea to tap on the game's increasing following in America and together along with some of cricket's biggest names organised a short T20 tournament which featured retired professionals who need no introduction to a cricket fan. Over the years, the fans could only imagine what a team would look like if all the best players from different countries played together. The T20 innovation and the subsequent ingenuity of the IPL allowed us to transform those imaginations into an annual phenomenon. This is what compelled me to think about such a scenario in the purest form of the game. What if the best Test players came together to compete against each other? 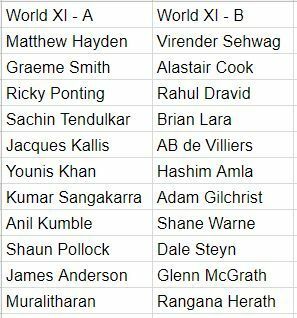 Time and again we have witnessed experts and players give their version of a World XI. Some are based on hard statistics, and some are purely a list of personal favourites. In this article, I have tried to pit two World XIs against each other, based on my experience as a viewer and a thinker of the game, and also a bit of stats. I am no expert and readers are more than welcome to criticize and scrutinize my choice of players. Constructive suggestions will be appreciated. I should also mention that I am only considering the players whom I have watched and all of them have been since the beginning of this century. Also, to add a certain amount of fairness to the selections, I have kept a criterion of a minimum of 50 Tests played since the year 2000 for a player to be considered. Most of the current teams have come out from a transition phase from an older generation to a new one, so I have excluded some exceptionally brilliant players whose careers still have a lot of time to flourish (ex - Kohli, Smith, Williamson, Ashwin etc). I have also chosen some players who are currently playing the game, but it might be fair to say that they are at the fag end of their careers and might retire in a couple of years or so. Since I am imagining the two teams to be playing against each other, I have taken care about the equitable distribution of skills and variety. Let me say that there is absolutely no question about the skills and quality of these players. I have divided them into two teams just for the sake of competitiveness. One is the marauder from Australia, among the numerous all-time greats who played together in an all-time great team. The other one is the talisman of South African cricket. Both are left-handed but posses very different batting styles and techniques. Hayden on his day could decimate any bowling attack in the world, like an unstoppable force. Smith's batting was like his personality, forthright and always effective. Any fast bowler would have his task cut-out against such an opening combination. The amalgamation of sheer determination to stay at the crease and brutality of sending the ball to the boundary ropes would give onlookers good return for their time and money, and also take the game away from the opposition in the process. It would be extremely difficult for any captain to formulate plans against such a pair, with Smith being one of the cleverest captains in the game himself. Fearless batting, divine stroke-play, exceptional talent, extraordinary resilience, these words don't even describe an ounce of what the above four names have given to cricket. An entire generation has grown up idolizing these men around the world. Whatever they do with a bat in hand goes straight into the coaching manual. There is nothing that can be said about these batsmen which haven't already been said or written. No one in this era has played a better front-foot pull shot than Ponting. 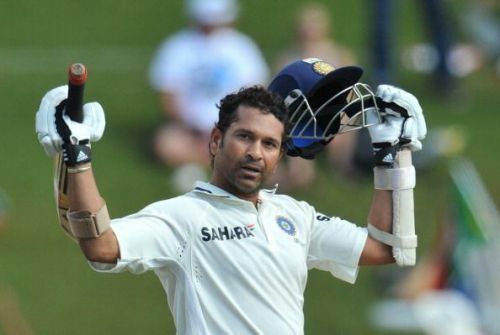 Tendulkar is the manifestation of God himself coming out to bat. Give an array of all-time great bowlers and Kallis is the man you need at the crease. And if somehow, through a miracle of sorts, these guys can't deliver, Younis Khan is the man who has made a habit of responding in crisis. In this era, it is next to impossible to think of a better middle-order, and only a handful of other names could match these guys shot for shot. Although he took a sabbatical from keeping in Tests in the later stages of his career and focused more on his batting, Sanga is still the greatest keeper-batsman to have graced the whites in Sri Lanka. A batsman of unparalleled elegance, Sanga played a major role in the making the early part of the 21st century as the golden age of Sri Lankan batting. He is among the few Lankan batsmen to boast of an equally good home and away record. With almost 200 dismissals behind the wicket to his name and a place among the Top 5 all-time run aggregate in Tests, very few would question Sanga's place in this team. There is a uniqueness to the way Jimmy Anderson swings the red cherry, 'The Anderson curve', as some experts say. Pollock in his days could perform similar magic at a lively pace. Bowling long spells came almost naturally to him. Bowling in tandem from opposite ends, these two can make life hell for any batsman. It's not easy to find a more deceptive leg-spinner than Kumble. Although not a great turner of the ball, his variations of pace and flight could fox even the best of the batsmen. He has bamboozled even the mighty Australians with his dip and drift. England and Pakistan have had their taste of helplessness against Kumble. India's greatest match winner with the ball, Kumble has been a proven performer against all teams and in all conditions. 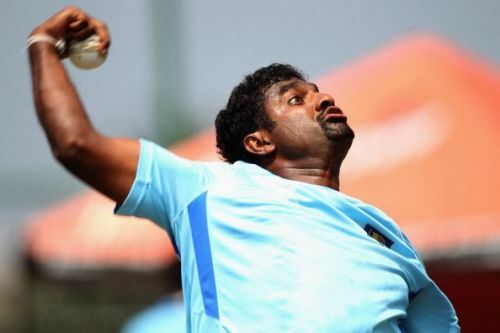 Muralitharan was an artist. Bowling square-turning off-breaks and doosras from hell. He could turn the ball even on a glass sheet. It was one of the toughest tasks in cricket to pick Murali from the hand. And it got even tougher with his inhuman ability to bowl long spells day in and day out. For 18 years, Murali was the go-to man for every Sri Lankan captain, no matter where they played. These four have more than 2300 Test wickets to their names combined. Each one of them is the highest wicket-taker of their countries (Pollock is tied with Steyn at the time of writing). They have won matches in a single spell of bowling masterclass, countless number of times. There are not many names in cricket who would fancy their chances against such bowlers. Sehwag, on his day, was like a cyclone which refused to die. No respect for swing or seam. Making even good spinners look like school kids. He has himself confessed that he didn't even consider the off-spinner as a bowler. Captains would scratch their heads when Sehwag was on song, with plans looking useless and fielders watching the ball being smashed all over the ground. Cook makes his runs like a machine. 33 years of age, he is already at no. 6 in the all-time list of Test run scorers. If Sehwag would demolish bowlers at one end, Cook would tire them out with effortless run-making without much spectacle. In a line-up filled with the fire of Pietersen and delicacy of Bell, his batting looked deliberate and unyielding. Determined to stay at the crease. Both Sehwag and Cook are once in generation cricketers for their respective countries, and at their best, only they could decide when to get out. Bowlers hardly ever had a chance. Some say that if Sachin Tendulkar had never held a cricket bat in his hands, Rahul Dravid would have finished his career as the greatest Test batsman on the planet. Not many put up an argument against this. If you have to choose someone to bat for your life, Rahul Dravid is just the right man for the job. Give a minefield of a pitch and you want no one else but Dravid. India started playing 3-day tests post his retirement. Few possess the ability to get under the ball like Brian Charles Lara. No one possessed that kind of a flair. The high back-lift and transfer of weight at the point of striking the ball looked surreal. No mortal could do that like Lara. And only Bradman was known to make massive scores as often as Lara did in his prime. In an ever-crumbling West Indies line-up, Lara took the ship to the shore single-handedly. If you have to pay to watch someone, it can either be Lara or Mr. 360, AB de Villiers. Arguably South Africa's greatest batsman since re-admission, ABD has revolutionized batting in the time he has spent on the crease. Hiding gaps in the field are almost impossible against him. In modern day cricket, we have been blessed to see such a combination of talent and innovation. And then there is Hashim Amla, a sight of pure serenity and calmness. 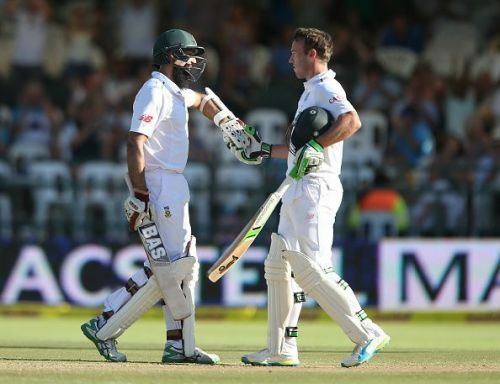 When Amla decides to stay at the crease, there is nothing much a bowler can do. Sessions can go by but his scoring won't stop. And there have been blockathons too, on rank turners. It would be a treat to watch such a middle-order against the world's best bowlers. And bowlers will surely have a hard time against them. The game had been played a certain way for over 100 years. Then came a player who completely changed how a certain aspect of the game was looked at. Before Gilchrist, wicket-keepers winning you matches with the bat were the stuff of lore. Gilchrist revolutionized the role of keeper-batsman. Bowlers would bowl their heart out to take the first 5 wickets of 'that' Australian team and then came in Gilchrist. A batsman who could win you matches in a session even on the 5th day. Such was his aura and reputation. In those days, only him and Sehwag could boast of a strike rate of above 80 in Test matches, that too after playing almost 100 Tests. The impact that Gilchrist had on the game with his acrobatic keeping and thunderstorm-like batting, he was quite deservingly named as the no. 1 cricketer of 21st century in a list of 100 players compiled by a famous cricket website. 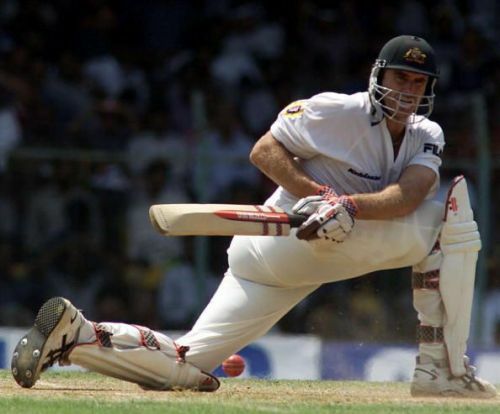 Warne revived the dying art of leg-spin bowling with his magical leg-breaks and googlies. The ball came out of his hand like a spit of a cobra venom. It landed on the pitch like a grenade from where it would explode and take the edge or the stump or the pad. Only a select few have been known to play him with the middle of the bat consistently. The trajectory of his ball looked like a problem straight out of a physics book. The revolutions that he imparted were difficult to catch clearly even on camera. And the turn made Mike Gatting and Andrew Strauss look at the pitch with hopelessness, even though there weren't many demons in it. And now imagine the wily old fox Herath bowling from the other end. This man can write a book on mastery of deception. He spent half of his career living in the shadows of the great Murali but still has more than 400 Test wickets to his name, and can add even more. He has been Sri Lanka's single greatest match-winner since the retirement of Murali-Sanga-Mahela trio. He single-handedly humbled the Australians when they visited Lankan shores about a couple of years ago. What would Sri Lanka not give to have Herath around for a few more years! 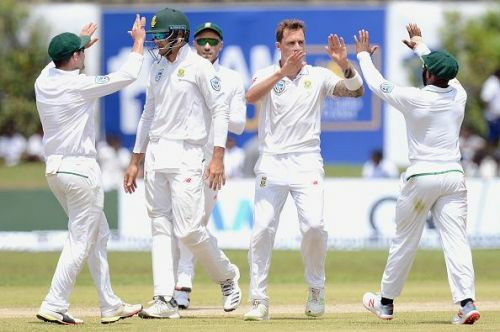 Dale Steyn and Glenn McGrath, the latter is arguably the greatest fast bowler of all time, and the former is a serious contender to replace him, at least in contemporary cricket. Steyn is fast and menacing. What strikes about him the most is the way he has performed in Asia under hostile conditions for fast bowlers. He takes a wicket every 41 balls, best ever for a bowler in Test cricket's 140-year history. That too at a miserly average of just about 23. On the other hand, McGrath's artistry with the cricket ball is unparalleled. The immense amount of control on line and length, spell after spell, even if there isn't a hint of swing, tells a lot about the man's ability. McGrath was known for especially targeting opposition's best batsman, an assertion only confirmed by his exploits against Lara and Sachin. His relentlessness to stick to the off-stump line with 4 slips in place has become a stuff of legend. Side Note: Captains of both the teams - reader's choice!